Once you get started playing golf, you just might catch "the fever." One of the main reasons golf is such a popular sport is because it can be played by people of all ages, skill levels and abilities. It's not uncommon to see young people and senior citizens alike enjoying the game out on the course. For beginners who may be unfamiliar with the game, you'll need to know how to get started. And once you get the hang of the sport, it's something you can enjoy for the rest of your life. Familiarize yourself with the game so that you completely understand the rules and terminology. Read about the game in books and magazines and search golf websites. Learn about golf equipment and etiquette. You can also pick up a lot of useful information by watching the professionals play on TV. The announcers also will have a lot of good information. Beginners might be intimidated to go to a golf course without much knowledge of the game. Tag along with an experienced friend so he can show you the ropes. If you are by yourself, walk into the clubhouse and talk with the employees. They will be able to tell you everything you need to know. You can mimic what you see on TV or what you've read in magazines, but the best way to learn how to play golf is to take lessons from a golf professional. The golf swing is complicated, so learning from the pros will give you the best understanding of the game. 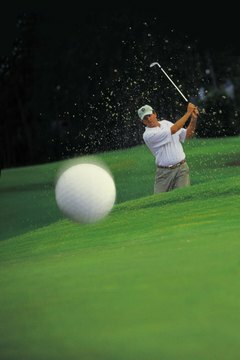 Most golf courses offer lessons by PGA professionals. As with everything, the more you practice, the better you'll get. Head to the practice range at the golf course and work on your swing. Most golf courses have driving ranges and practice greens for you to fine-tune your game. Now that you understand the game, you'll be able to enjoy it for a long time. Golf is a great opportunity to hang out with friends and family and meet new people. It doesn't matter whether you are a good golfer or a crummy one, you'll be able to play and enjoy the sport for years and years.